Blowout Sale! 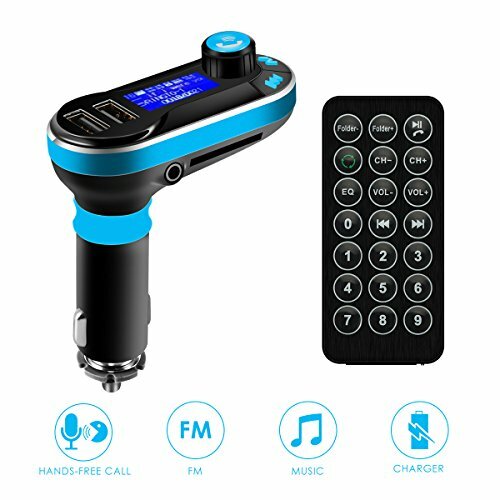 Save 77% on the Car Bluetooth FM Transmitter, SOONHUA Wireless In-Car Bluetooth Receiver Stereo Radio Adapter 5in1 Car Kit Music Player Hand-Free Calling Dual USB Support SD/TF Card for iPhone and Samsung (Blue) by SOONHUA at DJ Luu. MPN: 5489410. Hurry! Limited time offer. Offer valid only while supplies last. Why Choose SOONHUA? Easy Installation Plug and play, Easy to use. Memory Function: Fast Bluetooth pairing. Once paired, Auto-connect next time. With two USB charging ports, you can charge your mobile phone or other devices simultaneously. With built-in microphone, Supporting Bluetooth function, work with SD card, U flash drive and 3.5mm audio cable, you can enjoy music from different ways. Optimized working with any Bluetooth device. ✅ [Wide Compatibility]: SOONHUA Bluetooth Transmitter works with all kinds of popular smart phones the market ( iPhone/Android mobile phones like Samsung,HTC, LG ,Huawei,Sony,etc) and any other electronic devices with a 3.5mm AUX port such as MP3, MP4 Player, and tablet PCs. ✅ [Hands-Free Calling]: Simply paired your phone with this Bluetooth FM Transmitter and then you can make hands-free calls easily and safely. Just one click to hang up/off when receiving a call. ✅ [Multi-Playing Modes]. Support Bluetooth, Micro SD card (MP3, WMA, format supported), USB flash drive, and 3.5mm Audio cable (MP3 player, tablet, etc.) to play music. Easily make crystal clear hands-free calls with CVC noise cancellation technology. ✅ [Automatic Memory Function]: Its power off memory function enables you to start from the song you stopped last time. ✅ [Charge Easily]: With two USB charging ports (output 5V-2.1A), you can get your devices full charged in short time. The power comes from cigarette lighter so it is suitable for most cars.